Journeys on the Silk Road Through Ages—Romance, Legend, Reality is a compelling narrative about the legendary Silk Road, down the ages. It takes us back to the nearly forgotten times when the dusty, long road was discovered by herders and nomads in search of pastures and oases. It was a long trek into the unknown. This gradually turned into the fabled ‘Silk Road’ spanning from China and across Central Asia, with its numerous trade routes, staging posts, caravanserais on the one hand, and the rugged landscape through steppes, across mountains, deserts and nations on the other. The Silk Road stood out like a great artery, that sustained for centuries. The Road with its routes conveyed not only commerce but also ideas and philosophy of the far-east China to the far-flung Roman Empire in the west, drawing from and contributing to other regions and countries that fell along the way – Turkestan, Afghanistan, India, Persia, Mesopotamia, Palestine, Phoenicia and Anatolia, thus, linking the ancient and the medieval worlds. It was an enterprise of gigantic proportions; the great highway witnessed trade in almost all products, with silk, precious stones, porcelain, metals, and horses as chief commodities. Of these, silk was the foremost merchandise that merchants transported on camel caravans and upon mules from the Land of Serica. Slaves too were traded. Monks and warriors also walked along the trodden path. Merchants exchanged goods which made trade possible bringing in a flow of wealth, while monks and warriors exchanged philosophy, ideas, and statecraft, despite conflicts and wars. The narrative travels back to the times when the road started making history by joining imperial Xi’an with imperial Rome – a distance of more than 8,000kms – during the period of China’s Han Dynasty, sometime around 200 BC. This strangely endured till the present days of Communist China and OBOR, deliberating the Chinese Puzzle. The book is an adventurous amalgamation of history, travel and the unanticipated, and not merely a clichéd travel account. It presents a fascinating story of realms, rulers, travellers and merchants, both ancient and modern, with captivating collection of anecdotes, lores and current realities, from far and wide. Its brilliant web makes the book immensely readable. 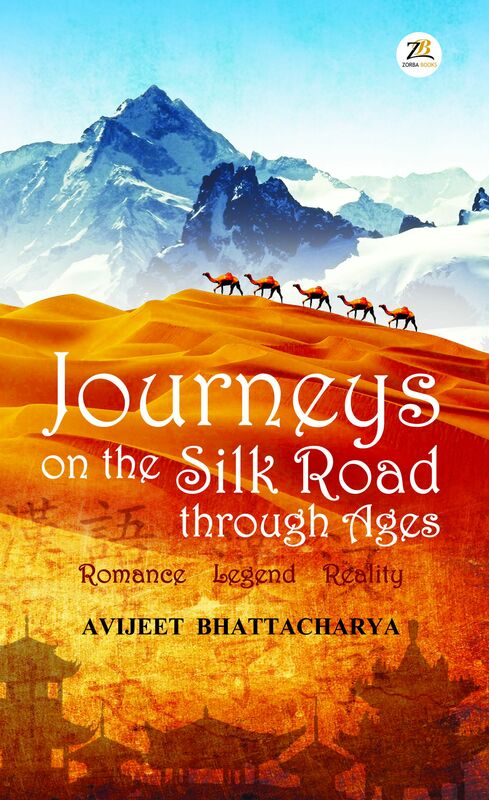 About the Author: The author Avijeet Bhattacharya is widely travelled and comes with a deep appreciation of history and geography, while he adroitly relates captivating stories and narratives. With his travel experiences and wide readings he turned into an ‘explorer’ of sorts, discovering places in the fabric of time, and became a chronicler of absorbing tales. In those journeys he explored the improbable, the unintended, the untested and went on to publish his first book, ‘Wander Years—A Roving Memoir’. The book was received with enthusiasm by discerning readers and travel critics alike for its immense readability as an absorbing account on travels covering more than 20 years, as well as for its graphic attention to every detail. The author, already retired from active service, and having turned into a writer, is an alumnus of Modern School and St. Stephen’s College of Delhi. At work he held several senior administrative and management positions while retaining his passion for literature, history and travel. Work, postings, interests and sheer pleasure for its own sake took him to various places where he toured, travelled, tasted and experienced with his family.